I stock mostly presta valve tubes. The exception is in 20" and 26", where I have both presta and schraeder in a few sizes to match the Schwalbe tires I stock for recumbents. Most of our tubes carry the "Salsa" brand name and are made by Kenda. Kenda is a major manufacturer of tubes and tires. I don't sell Salsa (Kenda) because I think they're better than any other tubes. I sell them because I can usually get the sizes I want, and the prices are reasonable. We never get complaints about the valves failing or sticking or pulling out. Inner tubes aren't very exciting. As long as they keep the air inside, and the valves work, there's not much to discuss. I also have some Michelin, Panaracer, Ritchey and Schwalbe tubes, mostly in sizes that Salsa (Kenda) doesn't offer. And we have some IRC tubes under the "AJ Boston" brand name. Again, it's not because these are better than any other tubes, it's because I can get them easily in the sizes to fit the tires I sell. There's no magic in tubes. For example, if you have a deep v section 26" rim, and want to use a 2" tire, you'll need to use either a valve extender, or an extra long valve. Salso doesn't offer a fat 26" tube with a really long valve, but Michelin does. Salsa makes their presta valves in three lengths. All sizes are available in 34mm, the standard presta valve length. And some sizes are available in 48mm and 60mm. These longer valve lengths are needed for deep V section rims, so called "aero" rims. I sell a lot of these "Aero" rims, not because they are aerodynamic, but because they are incredibly strong for their weight. My strongest 26" rim is the Velocity Deep V. You can have a 26" wheel that's stronger than the strongest 48 spoke 700c tandem wheel by using this rim, and only 36 spokes! The downside is you need tubes with long valves, or valve extenders, both of which many bike shops don't stock. Since I recommend the rims, I stock the tubes, in as many sizes as I can find. For most rims, the 34mm valve is long enough. Velocity Aerohead, Mavic Open Pro or Open Sport, Velocity Synergy and Dyad rims work fine with 34mm presta valves. Rims with a shallow V section, like the Velocity Fusion or Mavic CXP33 will be better with the 48mm valves, and there's no harm in using 48mm valves with most rims. If you have deep V section rims, like the Velocity Deep V, you'll want to be using the 60mm long presta valves. I wouldn't use these 60mm valve tubes with shallow rims. The long valve makes it easy to put a lot of bending load on the valve in a shallow rim. Too much leverage. So try not to use them unless you have a rim that needs them, like the Velocity Deep V.
The tube weights are from the manufacturer. I haven't weighed any of the tubes I sell. In my opinion, Schwalbe lists suitable widths for their tubes which are wider than I agree with. For example, they say their #18 tube should be used with tires from 28mm wide to 44mm wide. But I find it difficult to mount a 28mm tire when using their #18 inner tube. I recommend the #18 for tires between 32mm and 44mm, and if you are using a 40mm or larger tire, I'd rather see you use their #19 inner tube, which I rate from 40mm to 60mm. So, in my opinion, you should go by my sizing for Schwalbe inner tubes, not Schwalbe's sizing. We have tires scattered around the site. You'll find a page on Schwalbe tires here. There's another page on road tires here, though it needs updating as of June, 2006. 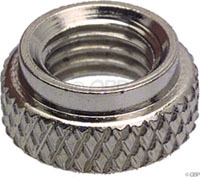 If you have rims that are already drilled to the larger schraeder size, you can still use presta valve tubes by using an adapter to take up the extra space. The best way is with presta valves having a threaded stem. Then you can use a special nut to hold the valve in place. The nut has a little raised ring that fits down into the larger hole in the rim. Remember, you must be using threaded presta valve stems. Most of the presta tubes I sell have threaded stems, but some, like the 60mm Salsa for deep V rims, are smooth sided, and won't work. There are other adapters available, though not from us at this time, that don't use the threading.